Churchtown Mennonite Church (Eastern Pennsylvania Mennonite Church) .25 mile (.5 km) east of Route 74 and Route 174 in Cumberland County, Pennsylvania, originated in 1835, when Preacher John Erb gave land for a meetinghouse three miles (five km) east of Carlisle. In 1885 another meetinghouse was built in Churchtown. The membership was low for some years, but in the 1950s as a mission station the work was revived. The Sunday-school attendance in 1954 was 66 (average). Under the leadership of William M. Strong, bishop, Mervin J. Baer, minister, the 1954 membership was 23. In 2009 the membership was 57. The congregation was originally part of the Lancaster Mennonite Conference, but joined the Eastern Pennsylvania Mennonite Church when it formed in 1968.
, . "Churchtown Mennonite Church (Carlisle, Pennsylvania, USA)." Global Anabaptist Mennonite Encyclopedia Online. 1953. Web. 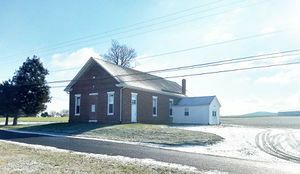 25 Apr 2019. http://gameo.org/index.php?title=Churchtown_Mennonite_Church_(Carlisle,_Pennsylvania,_USA)&oldid=163658. , . (1953). Churchtown Mennonite Church (Carlisle, Pennsylvania, USA). Global Anabaptist Mennonite Encyclopedia Online. Retrieved 25 April 2019, from http://gameo.org/index.php?title=Churchtown_Mennonite_Church_(Carlisle,_Pennsylvania,_USA)&oldid=163658. Adapted by permission of Herald Press, Harrisonburg, Virginia, from Mennonite Encyclopedia, Vol. 1, p. 602. All rights reserved. This page was last modified on 18 March 2019, at 15:24.